Grant McCann is interested in signing Peterborough United midfielder Anthony Grant. But, according to United’s director of football Barry Fry, Rovers are unwilling to meet Posh’s valuation of the player. 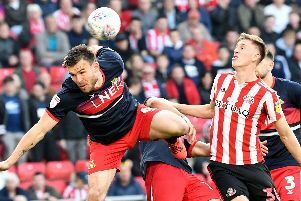 Transfer-listed Grant, 31, is said to have turned down the chance of joining Shrewsbury Town after being alerted to the possibility of linking up again with McCann at Doncaster. It is Peterborough’s policy to transfer list players entering the final year of their contract. McCann has set Rovers up in a 4-3-3 formation in their two pre-season friendlies to date. It is currently unclear whether Grant remains on his radar or whether the asking price is too high. McCann has so far signed attacking midfielder Ali Crawford from Hamilton Academical and added Leeds United striker Mallik Wilks on a six-month loan deal. Liam Mandeville this week joined Morecambe on a season-long loan deal and Rovers are attempting to move on transfer listed defender Tyler Garratt.